Many fans of the Marvel Cinematic Universe knew that Infinity War was going to contain some pretty big surprises, but were not prepared for what happened at the end of movie. Now that the film has been out for a while and crossed the $2 billion mark at the worldwide box office, there's not a whole lot of people who haven't seen it and crazy plot twists. 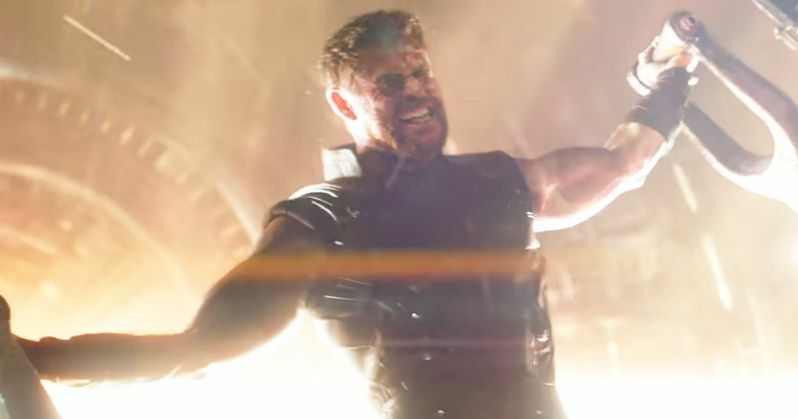 With that being said, Chris Hemsworth promises that Avengers 4 will be "even more shocking" than Infinity War, which is pretty crazy to think about. In a new interview with Esquire, Chris Hemsworth spoke about a variety of topics, but mainly his time working for the MCU. He commented on how happy he has been to watch the films grow and evolve instead of just rehashing the same old thing, which was something that Hemsworth admits that he was initially worried about. When asked about Avengers 4, the Thor actor revealed that it's going to pretty crazy. He had this to say. "If you were shocked by Infinity War, I think the second one is even more shocking, for other reasons entirely. That's what kind of blew me away the first time I read both scripts, is how they managed to orchestrate so many different characters but give them each their own separate shot and moments, and have it be elevated and feel fresh and unique, not just like a messy, thrown-together assembly of these guys." Let that sink in for a moment. Chris Hemsworth just said that Avengers 4 is going to be even crazier than the last movie and for entirely different reasons. That's a lot to take in and his words will be echoing around the speculation pool for the next year. Hemsworth added that he's even more excited for MCU fans to see the next installment than he was with Infinity War. He explains. "The second one I'm probably even more excited about. Just for people to see. I just think it's another step again. Each step we seem to take with these films, I've loved the fact that there's been growth and evolution and it continues to surprise people as opposed to sort of flatlining, which was obviously always a fear-that they'd run out of ideas or run dry of creative excitement. For me, this whole experience has been incredible. In particular the last one." Chris Hemsworth was also asked about Mark Ruffalo, who has a tendency to spoil parts of the MCU films before fans get to see them, and responded by saying that, "He could get away with murder. Anyone else, it might be highly scrutinized and punished, but he's beyond forgivable." Ruffalo famously broadcast the audio on Facebook Live from the first 15 minutes of Thor: Ragnarok while attending the premiere. But as Hemsworth says, he's just too nice and "beyond forgivable." The Thor actor was also asked if he had any advice for aspiring writers. He basically says that you should be named Chris and look just like him, which is actually pretty great advice if you think about it. Avengers 4 is all set to hit theaters on May 3rd, 2019 and according to Chris Hemsworth, it's going to a lot more shocking than Infinity War. You can read the rest of the lengthy interview with Hemsworth over at Esquire.